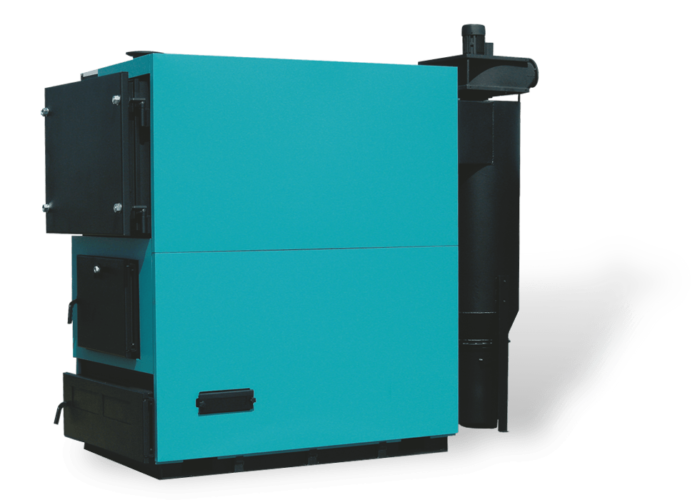 The EKO-CKS 500 steel hot water boilers (with rated thermal output 500 kW) are engineered to be connected to open central heating systems, for solid fuel firing. They are constructed for connection to a chimney through a cyclone and fan. The boiler (fan) regulation controls its functioning. The successful application of modern technologies and high quality materials as well as thoroughly tested technical solutions, make these boilers safe, reliable and easy to assemble. Designed for combustion with several types of solid fuels (wood, coal …). Properly dimensioned chamber and the control of combustion gases in three passages ensure a high degree of boiler utilization. Large doors and boiler furnaces allow firing with solid solid fuel and easy cleaning and maintenance. A separate body of the boiler is supplied, with a separate thermal insulation panel, allowing easy transportation and installation. 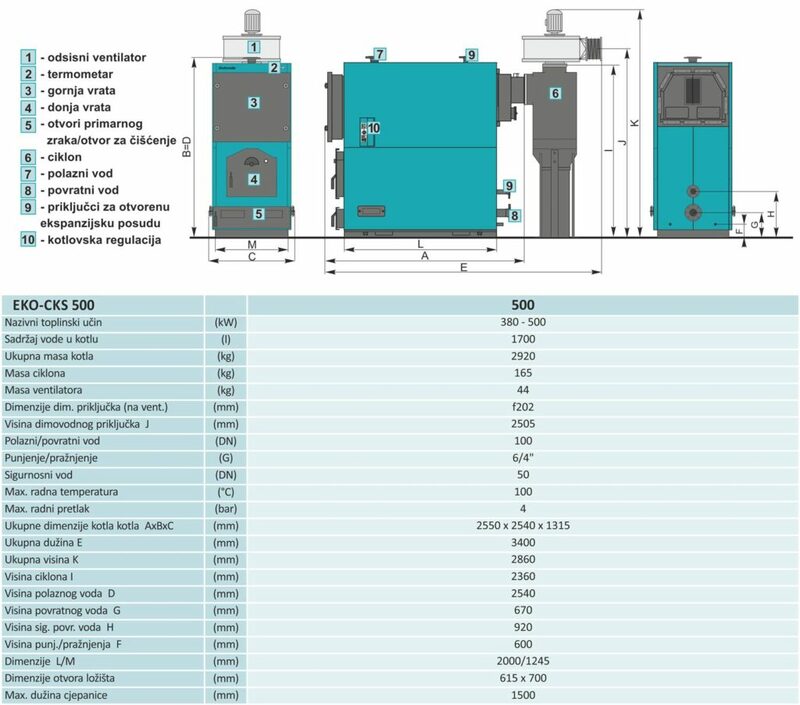 Steel hot water boilers for central heating systems engineered for solid fuel (wood, coal) firing with nominal heat output of 500 kW. They are engineered for solid fuel firing (wood, low-calorie coal …). Designed for connection to an open central heating system. A carefully sized combustion chamber with triple pass flue gas flow assures boiler operation at high efficiency. This makes the boiler very economical to use. The large door and combustion chamber enable firing with big pieces of wood, as well as easy cleaning and maintenance. Maximum working pressure is 4 bars, which enables connection to large heating systems. Connected to the chimney only through a cyclone and fan. The Cyclone CC 500, the fan for flue gases and the boiler regulator control comprises the required set. The Cyclone CC has a dust cleaning function from the flue gases. The fan pulls the fresh air into the combustion chamber. The flue gases are drawn out through the chimney. The regulator controls boiler operation. Linked to a thermostat, it activates the pump when the boiler temperature exceeds 75 °C and controls the protecting pump function (at 0-60 °C) and the fan. The fan switching is integrated. The large upper door enables easy and quick cleaning from the front side of the boiler. The body of the boiler is delivered separately from the casing with thermal insulation. This enables uncomplicated transport and reduces the risk of damage to a minimum. The boiler manufactured in accordance with ISO 9001 and ISO 14001.